When your stomach begins bloating, it can be very painful. Many women have to deal with abdominal pain and bloating on a regular basis, but luckily there are a few ways to help manage this condition. Read on to learn more causes and solutions for bloating. Stomach bloating is a condition defined by the stomach or abdomen feeling full and tight. It is often visibly noticeable, and your stomach may appear to be swollen or distended. Bloating is often associated with stomach or abdomen pain as well. Many women do not realize that many parts of the digestive system are very sensitive to levels of estrogen in the body. Estrogen is important in water retention, which can cause a woman to feel more bloated. During menopause, as estrogen and other hormone levels begin to change rapidly, water retention can become unpredictable and make bloating more likely. Estrogen also helps control production of bile, an important component of the digestive system that is used to break down fat. When fluctuating levels of estrogen mean that bile production is affected, the body may have more trouble digesting fat, which can then lead to a feeling of bloating. Another incredibly common reason for stomach pain and bloating is gas in the intestines. This can occur because of swallowing air - which is easy to do when eating quickly or drinking through a straw, for instance - or because of dietary changes and eating foods that break down into gas, such as many types of beans and other legumes. When the intestines can't move stool all the way through the digestive system fast enough, usually because of a lack of fiber in the diet, you can experience significant pain. You may also notice your stomach become bloated because of your inability to pass the stool. When you eat more than you are used to, or more food than you should in one sitting, your stomach may need to expand more than usual. This often causes pain, because it is stretching your stomach past its normal limits, and bloating because your body needs to make room for the food. Certain diseases, especially irritable bowel syndrome (IBS), can commonly cause bloating and pain. Celiac disease is another disease that will often result in swelling of the stomach. Both diseases also may cause gas and constipation or diarrhea. Natural remedies, such as hormone-regulating supplements and phytoestrogens for hormone fluctuations are another option that are free of the problems associated with HRT. Hormone replacement therapy (HRT) is one option, although it has a number of potential risks that may outweigh the benefits. For most other causes of stomach bloating, the most common way to relieve symptoms is to make dietary changes. Changing what you eat can reduce the likelihood of having excess gas and constipation, and most digestive diseases are at least partially treated with diet. Add fiber to relieve constipation, or reduce dairy to reduce gas. Knowing what causes your stomach pain and bloating will make it much easier for you to solve the problem. 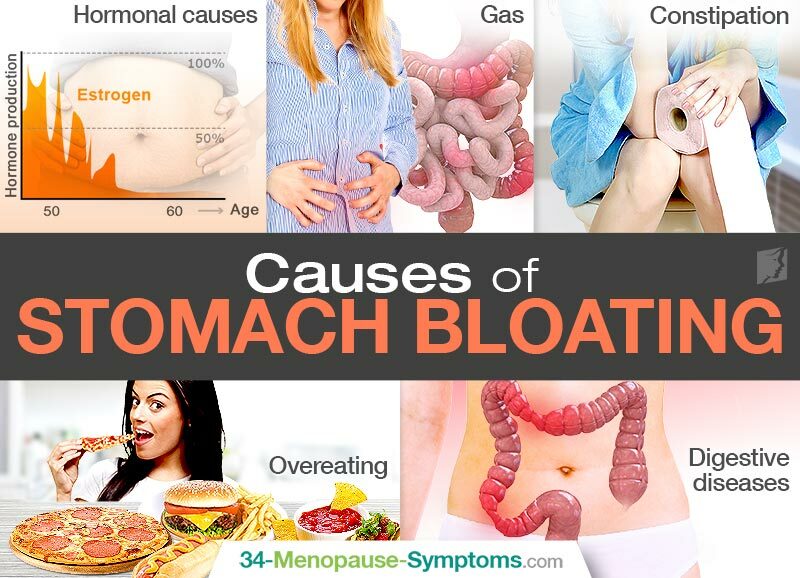 To learn more about how to reduce these symptoms, read about three ways to stop bloating. Watercress is a natural diuretic that helps prevent the body from retaining excess water, which means that it can help prevent bloating.